I spent the weekend with my friends Bibi and Edd in LA. Bibi and I have been friends for a long time, more than fifteen years. We met working at the consulting company where, shortly after I started working there, I was getting in to an elevator with my friend Carol to go to lunch and Bibi stepped in and said “Where are you going? And can I come with you?” We’ve been great friends ever since, laughing through that first lunch and continuously since. He met Edd about a year later, and they have been together ever since. They are, hands down, one of the best couples I know. They are committed and serious while being caring and hilariously fun, and they were able a few years ago, in the brief period of time that it was legal in California, to get married. I love them both, Bibi is one of my closest confidantes and Edd tolerates my almost constant uninvited presence in both of their lives beautifully. One of the reasons I treasure my relationship with them so much is the fact that at no time in the last more than fifteen years, have they sat me down, looked at me with compassion and said “but don’t you WANT to have babies?” and for this I am eternally grateful. I have so many Bibi and Edd stories that it would require a blog of its own. 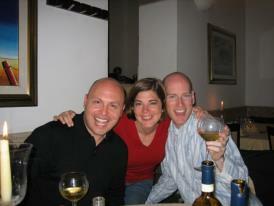 A few years ago, we traveled to Italy together, with Stacey and another friend Anne, and had a wonderful time. Whenever they travel, they buy a little notebook and carry it around with them, writing in funny things people say and interesting things they see. Our notebook from that trip, passed around amongst all five of us for perspective and stories, really begs to be published. It’s one of life’s small miracles that we all lived through that trip and no one was thrown off a train midway between Rome and Venice. At one point in Rome, a very drunk Stacey yelled “no paparazzi!” at a guy trying to take her picture, and then dropped her beer bottle and said “you clean it up, I’m American”. Earlier this year, the three of us traveled to the Grenadines (again, their vacation, I just came along) and we spent a week laying on a beach, snorkeling, reading, hiking and drinking rum. In the middle of all of my relationship drama, it was an incredible relief, so peaceful and fun that I was able to just put the stress out of my mind knowing it would come back the minute we got back to town. We met many great people on that trip and had an awesome time. The notebook on that trip was full. This was nothing compared to what happened when Edd took Bibi to an interview he was doing with Mira Sorvino. After the interview, Edd asked Mira to wave hello to Bibi, standing with the crew, and Bibi froze and then yelled “I….I….I LOVE YOU!!!!!!!!!!!! !” Edd doesn’t take Bibi along on interviews anymore. They live in downtown LA, in an incredibly beautiful penthouse apartment that is over twice as big as my condo. I usually go up there about once a month, we go out for the night and then I spend the night. Their place is like a refuge to me, and I love to wake up in the morning and take a bath in their huge sunken tub (in the room Edd calls “Andrea’s bathroom” because I’m there so much) looking out the floor to ceiling windows at the city. It is amazing. 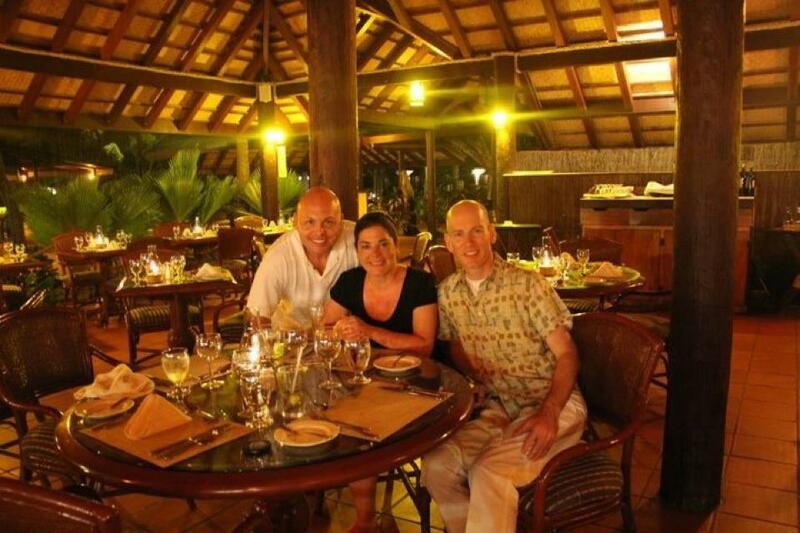 We went to dinner last night to the Palm (lobster!) and then met a couple of their other friends to walk around to other bars. We ended up at the only gay bar in downtown, which weirdly happens to be a Mexican gay bar where you see all kinds of interesting things and where they mercifully hand you bottles of beer with the caps still screwed on. 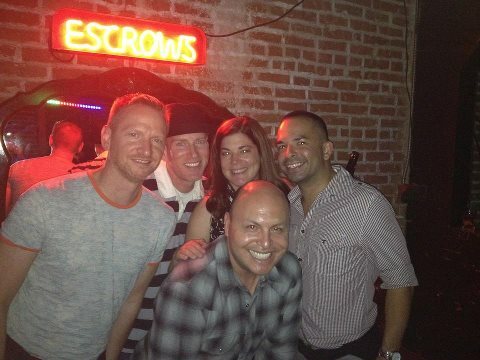 It was lots of fun, here’s a picture of the five of us under a neon sign that inexplicable says Escrows. We people watched, discussed the probability that at least half the people there probably had a wife and kids at home, and danced. At a split second pause in noise, during a David Guetta song, I pointed at someone and said in a way too loud voice “That is a man!” Sometimes you just can’t take the Orange County out of the girl. We left shortly after, because it seemed like a very good idea at 2 a.m. for us to eat nachos and corndogs, and headed for their home. OMG. 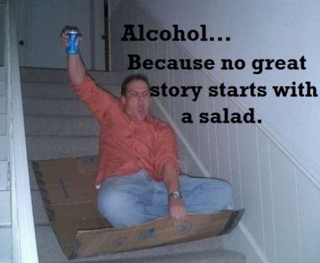 I laughed out loud at the first picture about alcohol v. salad on your post! Awesome.